Big news in the folkworld yesterday as Bob Dylan received a Special Citation from the Pulitzer Prize folks for his “profound impact on popular music and American culture, marked by lyrical compositions of extraordinary poetic power.” In response, For the Sake of the Song turns up a set of stellar live Dylan rarities, and claims Dylan’s recognition as a big win for rock and roll, but we know better — that description has folk written all over it, doesn’t it? Kudos, Bob. This would be the perfect moment for a set of Dylan covers…if we hadn’t already featured singer-songwriter Angel Snow‘s deep thoughts on Dylan’s “profound impact” and “poetic power” this past Sunday, along with her great take on Meet Me in the Morning. Rather than try to top that admittedly premature but no less effective tribute, today, we offer a compromise: a feature on the musician who took a Dylan song and turned it into the seminal soundtrack of every Vietnam movie ever made. 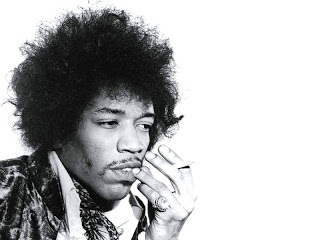 Ladies and Gentlemen: the songs of Jimi Hendrix. Like so many of our Covered in Folk subjects, Jimi Hendrix isn’t folk, but he has a kind of folk credibility that makes him a natural choice for popular cover songs. Woodstock, the drug culture, the sixties — if that electric wail and trippy, funky, post-blues sensibility wasn’t at the very heart of his sound, we’d be remiss not to claim this cultural icon as one of our own. But the challenge of covering Jimi Hendrix, of course, is that while plenty of Jimi Hendrix songs have lyrics, most don’t have that many words to play with. Take Voodoo Child, which uses a dozen words or so to proclaim repeatedly that the singer/narrator is standing next to a mountain, and is a voodoo child, and still manages to remain seared in our brains. Or the few short lines of hallucination poetics that is Little Wing, so trivial to the song’s success that while Sting’s cover is too maudlin to share here, Stevie Ray Vaughan’s instrumental cover comes across as masterful and complete. It’s telling, in fact, that many of the best Hendrix covers out there are by blues musicians, as in many ways, Hendrix lyrics are like the words in the blues — they might offer some context, but it’s not the words we look to when we struggle to find ourselves in the blues experience. It’s not that Hendrix songs are meaningless. And it’s not that his lyrics are useless, really. It’s that with a few exceptions, Jimi speaks with his guitar, and uses his voice, even the lyrics themselves, as another instrument, a factor to set the stage, so that the technique and raw emotion of the strings might more effectively convey the subtleties of emotion that the song is intended to “mean”. As such, a Hendrix song offers several avenues of ownership for a covering performer. It can, for example, be an opportunity to feature the production — to shape a sound that in toto compensates for the lack of a prodigy at the center. Many artists who perform on or just over the pop edge of the folkworld have done just that. The heavy worldbeat production makes Voodoo Child a pop song in the hands of Beninise singer Angelique Kidjo, but the bounce and cry of the vocals call to the original. Though Cassandra Wilson‘s cover of The Wind Cries Mary is languid by comparison, it, too, shares a jangly acoustic jazzpop sensibility and an honest delivery which make it authentic, as if played on a jazz bar stage after the audience had gone home, and the mics had been turned off. Other related genre covers focus on the instrumentation itself, reminding us that Hendrix was a guitarist first, and a band member and singer only afterwards. The Corrs bring a more traditional folk rock sensibility to their live cover of Little Wing that could pass for a mellow version of the original, were it not for the pipes and fiddle. Bluegrass dobro wizard Jerry Douglas may sing the words to Hey Joe, but as with Hendrix himself, it’s the instrument who is the real star here. And if Memphis blues/rock prodigy (and sometimes rapper) Eric Gales sounds little like Hendrix when he sings through his guitar, it is only because here, too, the heavy drums and lyric only lend support to what is ultimately a guitarist’s song, played b a guitarist of extraordinary talent. If few true “folk” musicians and singer-songwriters take on Hendrix, it is because so few of his songs leave room to build on lyrical meaning. Because of this, to me, the most daring and often the most interesting Jimi Hendrix covers are the ones where the emotional emphasis is shifted to the voice. Emmylou Harris covers everybody, but I think her cover of May This Be Loved is among her more successful attempts, and surprisingly so, in part because of how effective her aging yet still etherial voice applies itself to the sparse, repetitive lyrics — though the very heavy wash of sound in the production, which features what seems to be an electric guitar played back in reverse throughout, provides an effective, moody underscore. Similarly, though Alison Brown‘s Angel is a true ensemble piece, with rich harmony vocals and a full acoustic band from banjo and guitar to bass and piano, Beth Nielsen Chapman‘s warbly, honest lead vocals beat Fiona Apple‘s earnest attempt to bring the blues to her voice, which almost works, if both voice and production didn’t teeter on the edge of channeling Cher and Aaron Neville. And most effective of all, the nuanced, impish delivery Rickie Lee Jones brings to Up From the Skies recenters the song on the lyric without losing a whit of the hopeful, playful emotional tone of the original. A mixed bag today, then: a few stellar covers, and a couple of flawed gems worth celebrating nonetheless. Heavy on the fringes of the folkword, too, with worldpop, cool jazz, and plenty of blues and bluegrass to choose from. Perhaps, in the end, this is the more honest tribute to a man like Hendrix, who — for all his wizardry — was a musician for whom experiment and experience, not perfection, were the ultimate goal. Though most tracks on today’s list came from compilation albums, the Hendrix estate doesn’t really need our cash. On the other hand, today’s artists really do deserve your support. As always, clicking on artist names in the post above takes you directly to artist websites for purchase and, in most cases, further tuneage. Looking for today’s bonus tracks? How about a few versions of that Dylan cover? If you missed it a couple of weeks ago, head on over to last week’s Audiography guest post to hear a pair of covers of All Along the Watchtower from Canadian Celtic rockers The Paperboys and old-school American folk rockers Brewer & Shipley, who you may remember as the guys who originally recorded “One Toke Over The Line”.